I will admit that I have always been hesitant to describe my rheumatoid arthritis medications as chemo, or “cancer drugs.” Part of this is my aversion to pity; the other part was that, at times, people use the term “chemo” incorrectly when describing their arthritis treatments. Lastly, I’ve always felt that it was a bit disrespectful in a way, comparing rheumatoid arthritis to cancer. Somehow, when I was on it, it had felt wrong to me to talk about my Methotrexate, that was a FAR lower dose than the dose that cancer patients get, in the same way that they would discuss their medications. I don’t like competing, I don’t like comparing diseases, and I don’t like negative attention. I am always careful to not overstate my health problems, or to make them seem worse than they are. But at the same time, I also try not to downplay them: autoimmune illnesses are wretched, and can be pretty serious. In the past, I chided and chastised those who would talk about their “chemo days” in regards to arthritis. Perhaps, this was judgmental on my part, and I am a big enough and honest enough person to admit that. Now that I have actually had to get a chemotherapy drug for my various autoimmune conditions, I have revised my stance on the use of the word — but only if it is used correctly. Though chemotherapy “technically” could be used to describe any form of chemical therapy (in essence, that would mean almost any medication, particularly those administered intravenously,) the fact is that all drugs are NOT chemotherapy in the way that the term is widely used and accepted by both the public and the medical community. But some medications are — and some of those medications are used to treat arthritis. I think my issue with the word “chemo” in relation to arthritis was mostly when people would misuse it, or would use it exploitatively, solely to garner sympathy. Remicade, Orenica, Humira, and drugs like them are, in fact, biologic infusions, not what most doctors would refer to as chemotherapy. They aren’t cancer medications, but they are administered in the same way that many cancer medications are. In fact, when you get these drugs in the IV form outside of your rheumatolgist’s office, you are likely in an oncology center. You may even be sitting next to a cancer patient who is receiving chemotherapy, and the average person taking a glance at you may not be able to tell the difference: the setup looks the same. But to be clear — and to be fair — those drugs aren’t chemo drugs. They are not fun — in fact, they’re pretty awful , and can be dangerous in their own right — but they are not as dangerous, and while they may have similar side effects, the RA drugs are not as strong, and thus typically do not have as bad of side effects as chemo does. Granted, there are exceptions to every rule: I’ve ended up hospitalized because of biologic infusions. My hair thinned while on Methotrexate and I’m sure that some people do have chemo-like reactions to their immunosuppressants and biologics. But, I feel that it is still irresponsible and insensitive to misrepresent the medications to the public, to your peers, and to other patients. That said, Methotrexate admittedly IS also used for certain types of cancer — often, juvenile forms of leukemia. There is a difference, though: methotrexate, even when used for cancer, is not really considered to be a chemotherapy drug, and the dosage for rheumatoid arthritis and juvenile arthritis is drastically less — sometimes up to 1/100 of what a cancer patient would get. Again, to clarify: Methotrexate is awful. Rheumatoid & juvenile arthritis are awful. I’m not denying these facts: just pointing out that it, in my opinion, is an inaccuracy to state or act like it is on the same level as what cancer patients deal with. It’s a glimpse into what they deal with, maybe a portion or a small taste of it — but, to me, it isn’t the same. That’s why I was always careful when I was on Methotrexate to explain that it was the same drug that was used, but not the same dosage, and often I left out the cancer-Methotrexate link altogether. When I was prescribed Rituxan – which IS, in fact, an actual chemotherapy drug, that IS used to treat various forms of cancer (particularly lymphomas,) I was uncertain how to present it. At first, I didn’t want to tell anyone I was doing it at all, because I didn’t want to worry anybody. Then, I thought that if they found out I was doing it and DIDN’T tell them, that they’d be MORE worried. 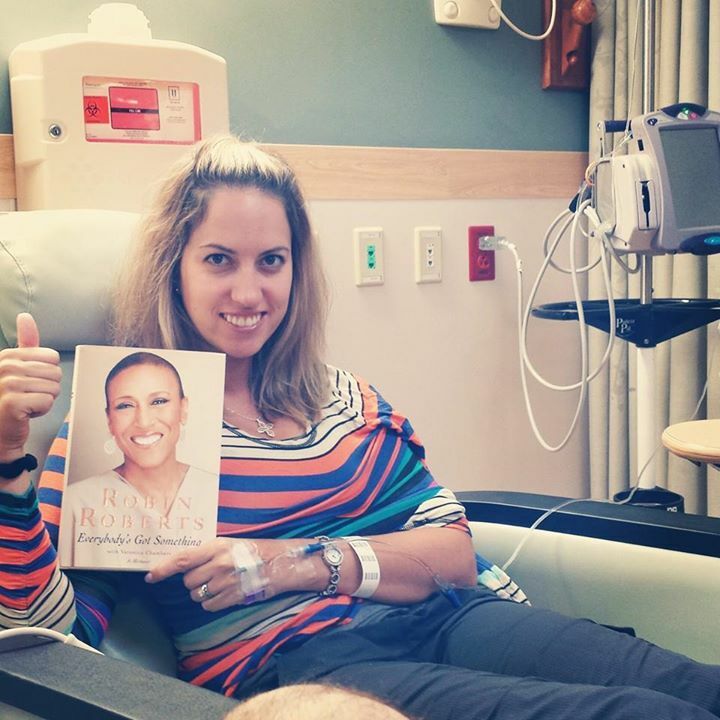 I ultimately decided that I wanted to share that I was doing it, and that I would share that it was chemotherapy, mostly because that aspect scared me a bit, and I needed to talk about it. I chose to go on it specifically because of its ability to treat rheumatoid arthritis, lupus, sjogrens, and possibly celiac AND for its link to treating cancer, since my combination of autoimmune ailments puts me at a higher predisposition for lymphoma — and so I wanted to share with some people that this was part of my decision in choosing the drug. I didn’t want to hide or downplay my nervousness about the drug; and I didn’t want to hide how serious these illnesses can be, but I also still didn’t want to act like I was having CHEMOTHERAPY-chemotherapy, if you know what I mean. After I got my first round, I decided to share my experience with some, and became a little less scared of using the word. It was a chemo treatment, so I called it such. I was still careful to state that though it was a similar dosage as a cancer patient would get, that I was getting it a lot less frequently, that my reliance on the medication was a lot more temporary, and that it was administered to me more slowly — a little differently than it was to them. I didn’t want people to be scared: I wouldn’t lose my hair, or lose weight. But I also needed people to know that I would be sick for a few days, that it wasn’t pleasant or easy. I needed people to know that I had some anxiety about it, and that it was, in a sense, a big deal — but, also that it was nothing for them to worry about. While Rituxan, Methotrexate, and some other drugs to treat autoimmune and rheumatic disorders are chemotherapy or are used to treat cancer, the most important thing for my loved ones AND for RA patients to remember is that: it may be chemo, but it’s not cancer. RA, and Lupus, and these other illnesses are terrible. But they aren’t cancer. My personal opinion is that you can’t compare two illnesses that are completely different; and you shouldn’t compete with one another. That said, it is up to you and you alone what treatment information you share with your family, friends, loved ones, and the public. It’s up to you how you describe it — I can’t tell you what to say or not say. This is a unique experience for each of us. 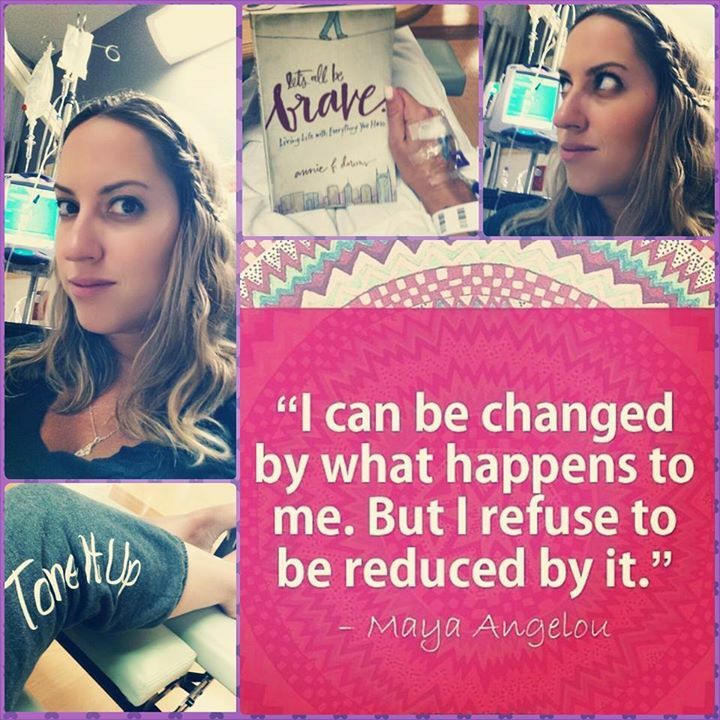 One person close to me chastised me for sharing photos from my first Rituxan infusion with the public, but I decided that it’s my story, my treatment, and my journey. As someone who is an arthritis advocate in the public eye, I felt that it was my responsibility to share that part of my journey with all of you. My choice to try a drug like this was a big one for me, particularly with my coming from a holistic background. It wasn’t one that was made easily, or taken lightly. And while I’m aware that yes, I (gasp!) had a couple of chemo treatments, and that there can be a correlation between cancer and autoimmune illness, I am so ever-grateful that it was for these (admittedly-still-crappy) conditions, and NOT cancer. Take from that what you will — as always, this is just my personal opinion. All I would suggest is that if you choose to use the word chemotherapy in regards to your treatment, that you are using it correctly, and with the right intentions. As always, if you agree — or disagree — we ask that you (respectfully!) leave your comments below! Tags: Arthritis Ashley, Arthritis Blog, Arthritis Foundation, arthritis medications, arthritis treatments, Ashley Boynes-Shuck, Biologic Drugs, biologics, chemo, chemo for arthritis, chemo for celiac, chemo for JA, chemo for lupus, chemo for sjogrens, chemotherapy, chemotherapy for arthritis, chemotherapy for juvenile arthritis, chemotherapy for lupus, chemotherapy for sjogrens, Chronic Illness, drugs for arthritis, humira, JA, JIA, JRA, Juvenile Arthritis, leukemia, Lymphoma, Methotrexate, Mid Atlantic AF, Mid Atlantic Region, orencia, RA, Remicade, Rheum, Rheumatoid Arthritis, Rituxan, Spoonie. Bookmark the permalink. Well…hm. I see your desire to be accurate, but at the same time saying Methotrexate is a chemo drug is accurate, and saying biological infusions are similar to getting chemo is accurate. I am fortunate, in that my RA doesn’t (yet) necessitate those particular drugs. BUT both of my parents had cancer, as have many other of my relatives. My mother lived (and has been cancer-free for 30+ years). My father died. You seem to want to downplay RA compared to cancer. According to my rheumy, RA is in fact life threatening. So is cancer. More so. But while chemo can actually cure cancer, there is no cure for RA. Chemo is for a season with cancer – it either works or the person dies – and it’s not the only option, because cancer can in many cases be removed surgically. RA is for a lifetime, with or without the drugs. And yes, the drugs can have severe side effects, including cancer (I have a friend that happened to). I agree with Brenda that people have no clue just how serious RA can be and explaining the treatment in a way people understand is not being disrespectful to cancer patients at all. I’m in a volunteer group at church with several cancer survivors and they’ll tell you that everyone’s cancer experience is unique, just in the same way RA affects people differently. Some of us are lucky and can live somewhat normal lives with it. Others, not so much so. And others have indeed died from RA, complications from it, and from the drugs to treat it. So, yes, our drugs are different, as is our disease different from cancer. We absolutely don’t need to “awfulize” it and cherish the good moments, rather than focusing on all bad, but I think it’s ok to compare something so people have a better understanding of what we are dealing with. Just my two cents. Blessings! Hi, Linda. Most rheumatologists classify methotrexate as a DMARD when used for RA, and as an anti-cancer drug when being used to treat cancer. It sometimes falls under the blanket term of chemotherapy but not typically in the context of RA, though some doctors may call it such. And yes, biologic infusions are “similar” to chemo, but aside from Rituxan (which is chemotherapy,) they are not. My issue only lies with when people misuse the terms to mislead people or garner pity/sympathy. I think that inaccuracies with this time of terminology can either purposefully or unintentionally contribute to the spread of misinformation which can in turn further cultivate the negative stigma and air of mistrust surrounding RA and simliar conditions. I totally agree with things that you are saying! I spoke about this recently in a couple of my Facebook Live chats 🙂 Cancer is an awful and serious disease. So is RA. But they are different and should not be purported to be the same. While treatments overlap and share similarities, as you know, they are unique from one another. (Aside from MTX & Rituxin.) 🙂 Have a blessed day!Thanks for commenting. I agree and I believe social media has perpetuated this increase of calling RA meds chemo. I also feel, not all but some are using it to garner pity. When you use a picture of an IV site and say receiving chemo, I believe you are showing the wrong image. Maybe not on purpose but to know someone who actually has cancer I can understand how that could be completely wrong. Just as if someone just had a knee injury and said that a muscle strain was the same as RA and a whole community started posting things referring to “less serious” (at times) injuries as being the same as having an auto immune disease. Rituxan is actually considered immunotherapy..it contains antibodies against CD-20 proteins on certain B cells. Those antibodies, and your own immune system, attack the CD-20+ cells to destroy them. Yup! That is correct, and I do acknowledged in the original post and in my FB videos that Rituxan is, in fact, chemotherapy 🙂 So, thank you for sharing: you are correct. I’m speaking more to my personal comfort level describing it as such due to connotations and the differentiation in dosing when compared to the dose a cancer patient gets, and also I am speaking to the fact that many RA patients refer to other medications as “chemo” when they simply are not. If you follow me, you will see that I DO call Rituxan “chemo” in certain instances, but I won’t use it as a way to cultivate pity or cause alarm among friends and family. My issue lies with 1.) intention behind calling it chemo and 2.) accuracy when referring to other RA meds as chemo. As long as people’s intentions are pure and positive, and they are using terms correctly, I will never condemn them for doing so. I 100% agree and share the same EXACT views that you have presented and have actually been on all available medications for Juvenile Idiopathic Arthritis (JRA) since I was 11. Rituxan worked wonders and I only left with some tiredness and a headache, until the second round. During the second infusion (which is when this typically happens) I had anaphylaxis. No, not just hives and itchy throat. Full on reaction. Face swelled and I stopped breathing. So that med was scratched off the list. I was pre-medicated and I ALWAYS am. That’s the thing with auto immune or biologics… your body doesn’t want something shutting it down so it’s normal to have reactions to these meds. I have been on methotrexate multiple times in every form. It is a horrible med but it does work for a lot of people. I cannot imagine it in a higher dose. The nausea alone is over whelming for me. But back to the main subject, I have JRA and I am 29 and I have never put myself in the same category as a cancer patient when receiving ANY meds. Even ones that ARE used to treat cancer. I don’t have cancer and the dosages are no where near the same. I believe I am lucky to not have cancer and to have something not as severe. I have always viewed myself as lucky compared to the horrendous diseases out there that I COULD of been diagnosed with. I’m not saying that RA is a walk in the park because it is not and is debilitating and life-changing. It is an invisible illness that gets over-looked and is hard for uneducated people to understand. We all (or most of us that are lucky) “look fine” but can be in agonizing pain and fatigue. In my opinion THAT is that hardest part of it all. Looking normal but we are not and that’s ok. I can’t keep up with people my age and I’m ok with that. But no, I don’t agree calling meds used to treat RA as cancer meds u less you are receiving similar doses or even IVIG. But that’s just me. A lot of people recently have started writing that with their post all over social media. I can relate to this completely. I couldn’t have written it better myself! Thank you for sharing! Good luck with treatment!